Of course it's all right. He was your dad. Phil Rickman's Merrily Watkins books fall solidly into the horror/crime genre, where the books are doorstop thick and the procedural quality of classic detective fiction is applied to some of the most horrible crimes the authors can imagine. It's one of those genres where you can tell exactly what the book's going to be like from the cover: flawed detective, horrible crimes, efficiently written procedural. Merrily Watkins is the protagonist of more than a dozen books; her unique selling point is that she's a deliverance minister, which is what the Church of England calls diocesan exorcists these days, as well as being a widowed single mum who has a tempestuous relationship with her teenaged daughter Jane, and so the crimes she solves are often of an occult nature. As a premise for a long running series of novels, it is rock solid, and while I've never developed a taste for this sort of book, it is plain to me that Rickman deserves ample praise for creating a premise that works so beautifully and simply and yet which has so much space for drama. Writer/director Stephen Volk's Midwinter of the Spirit in fact adapts the second book in the series, which seems counterintuitive at first; apparently though, that's the one where the direction of the series is set and possibly it's also one of the better ones, and it seems to me that the intention was that this would be the first of a series of adaptations. There's no sign of a renewal, although a lot of folks watched it and it got decent critical notices. But I get the distinct impression that fans of the books absolutely hated it. An adaptation of any kind exists in a weird intellectual space; on the one hand I will fight you in the street to protect the assertion that a film deserves to stand on its own merits and should be judged by them alone, adaptation or not; on the other, there's this other version of it that exists and a whole bunch of people liked it enough for you to have to address it. I'm going to talk more about adaptations next week, but right here and now I'm going to make the controversial point that most people don't understand what makes a good adaptation. A good film adaptation is never "just like the book". It can't be. Film is a different language, and as anyone who's ever translated anything from one language to another knows, literal word for word translations are the worst sort of translation. You translate word for word, you ironically miss a whole raft of meaning. When you translate any document from one language to another you have to work on a principle called dynamic equivalence: you don't always translate words, you translate meanings. I'm going to say a prayer with you. And that goes double when you translate a book into a visual medium. You have to know what to add and what to take away, and what to present in a non-literal fashion. And whether you do that well or not makes the difference between a good adaptation and a bad one. So, as fond as I am of David Lynch's version of Dune, it's a pretty bad adaptation, slavishly copying chunks of the book that you probably could do without, while leaving out things that were really important to the central theme of the story and adding elements about voice guns and shouts making it rain and heart plugs that were kind of baroque and fun but added nothing that advanced the themes of the story. On the other hand, David Fincher's version of Fight Club runs roughshod over the ending of the book, chucking it out and rewriting it completely, except that this ending says exactly the same thing that the book says, better than a direct translation could ever do. And even though the film is in places quite different in literal terms, it faithfully translates everything good and everything bad about Chuck Palahniuk's novel. The paradox is that if you want your adaptation to be just like the book, you can't make it just like the book. 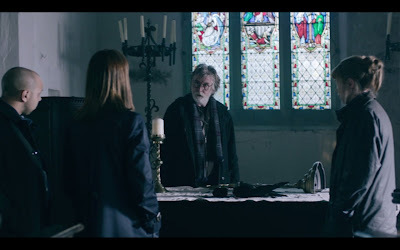 So when people who love Phil Rickman's books say that the TV adaptation of Midwinter of the Spirit is terrible because it's missed things out and changed plot elements and characters, I'm not inclined to take that terribly seriously. It's a big fat book (which I do have a copy of and will get round to reading, eventually). Some things you're going to have to cut to get it into three 45 minute episodes. Some things you're going to have to lose because there are things that you simply can't show on ITV1, even after 9pm because it's one of the popular mainstream channels and in the digital age, popular mainstream channels don't push the envelope. So that bit where the teenaged Satanist goes down on someone in the cathedral, that's not going to fly, frankly. As it happens, the TV version goes about as far you can go on ITV1 these days. Could we have a chat, Canon Dobbs? Here's Merrily Watkins (the underrated and underused Anna Maxwell Martin), and she's just started in deliverance ministry; she has doubts as to whether she'll be able to do it, and her mentor Huw (David Threlfall, who you might know as Frank from Shameless) is ambivalent about whether she's cut out for it too, but here she is, widowed and with a perilously fragile relationship with her daughter Jane (Sally Messham). 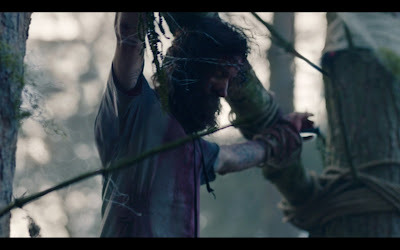 Merrily gets called in by the police to offer expert advice on a man who's been crucified in the woods; things found at the man's home suggest a larger context. She also has to attend the death bed of a man named Denzil Joy, who by all accounts was a really horrid guy. She's present as he dies; in his death throes he grabs her hand and his hideous, ragged fingernail cuts her hand. The cut becomes infected and she begins to be haunted by Joy (and is it just a series of hallucinations brought on by stress and mild septicaemia or an actual haunting? Wisely, the serial doesn't offer a definitive answer). The last person to pray for Joy, Merrily's predecessor Canon Dobbs (veteran character actor David Sterne), is having a breakdown. Local churches are being desecrated. And Jane, at loggerheads with Merrily because neither is dealing very well with the death of Merrily's (adulterous) husband, acts out, making friends with a girl called Rowenna (Leila Mimmack), who introduces her to a new circle, including a woman called Angela (Siobhan Finneran, just as villainous here as she ever was in Downton Abbey). 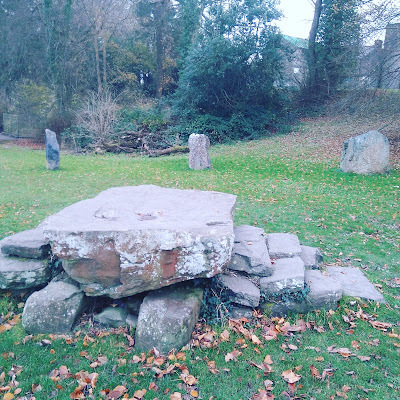 Angela and Rowenna get Jane hooked into the occult, and Jane, feeling freed and able to lash out at her mum, willingly goes deeper and deeper without once realising how badly she's being played. The two main stakes, then, are the occult conspiracy in which Merrily finds herself entangled, and the question of whether Merrily will be able to rescue her relationship with her daughter before having her own nervous breakdown. 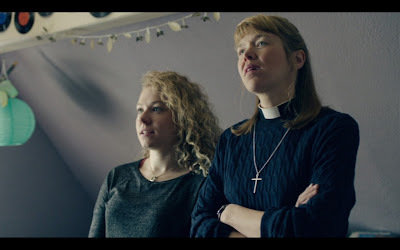 Anna Maxwell Martin is excellent as the out-of-her-depth vicar whose urge to do the right thing is costly to her own sanity, and it's evident that the makers of the series didn't just consult with Anglican deliverance ministers, they listened. It's easy enough to present the raw facts of a religion, but Midwinter of the Spirit presents what Anglicans care about, and tries very hard to make you care about it too. 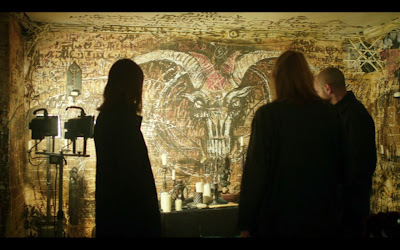 On the other hand, the esoteric details aren't nearly as well sketched and the New Age/Occultist/Satanist/Ritual Magic group are, well, it's hard to tell what they are. 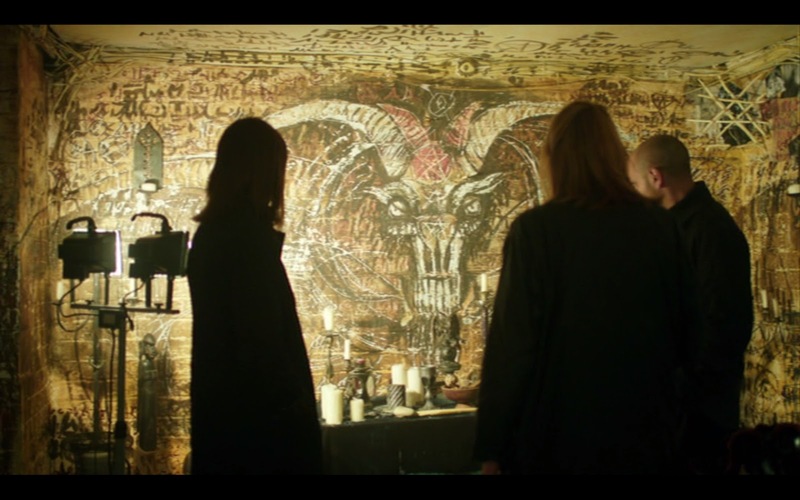 Merrily identifies Baphomet on the wall of the murdered man's house, but that's literally as far as it goes. You just have a syncretic occult group who are Really Obviously Evil from the get go. Saying that Jane's new pals are playing her isn't even much of a spoiler: the screenplay makes it abundantly clear that they're using her, right from the beginning. Part of the very demonstrative, declarative way the drama does things is very much down to to it being an ITV drama. It's very hard to define, but anyone brought up on British TV can tell the difference between an ITV drama and a BBC drama within a couple minutes of watching (in fact I found Midwinter of the Spirit on Netflix this week, having entirely missed it on broadcast, and did indeed think, “Oh, ITV” within a couple minutes of the start). It's weird how obvious it is, how choices in pacing, music, and editing can make a channel's output so distinctive over another's. ITV dramas tend to be more “hooky”; because it's a commercial channel, shows are edited into roughly fifteen minute chunks, so you have a plot beat every quarter of an hour or so and then five minutes of adverts, and you find that the first quarter hour is often, in an ITV drama, crucial – because if it hasn't grabbed the audience by then, they switch off in the ad break. 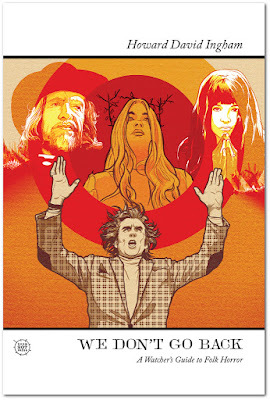 So it is with Midwinter of the Spirit, in which we meet Merrily, establish the tension with her daughter, show she's a deliverance minister and explain how and why she's not confident, introduce Canon Dobbs and establish he's losing the plot, and ends on the ad break with Merrily being shown a man crucified in the woods with a crown of barbed wire on his head, all in the first fifteen minutes. And when you have to get about six hundred pages of genre fiction, rich in incident, you get a serial that travels at a breakneck pace. This is not a bad thing, and doesn't mean it has to be loud or histrionic, because Midwinter of the Spirit isn't either of those things. But it is structured in a way to show you A, B, C and so on, and makes sure that all these plots are kept running with everyone watching along with the ride. 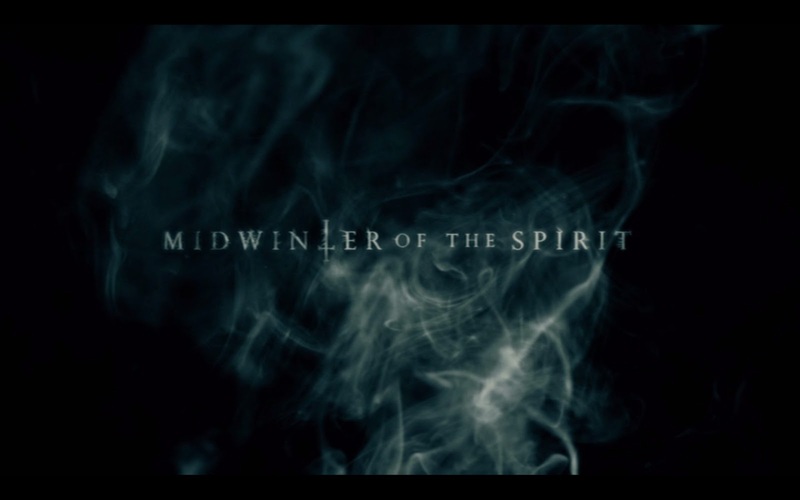 I enjoyed Midwinter of the Spirit quite a lot. It's not perfect. The main problems with it aren't anything to do with style or adaptation. The biggest thing that annoyed me was that the Occult Baddies are shown as having done some Satanic Child Abuse in the past, and Social Services intervened and everything, and that's not a narrative thread you want to present uncritically. When well-meaning evangelicals convinced Social Services that Satanic Abuse was really a thing, it did serious real world damage years ago, and to wheel that out as a straight narrative leaves a bad taste. I mean, what is this, the 1980s? There's also (big spoiler) an out-of-nowhere Scooby Doo ending, a thing that literally made me say “What! ?” out loud at the screen. I will have to watch it again, but my head was reeling at it. There's no way it were kids that did this. But notwithstanding that, there's a lot to like here. Martin and Threlfall are reliably excellent. Martin sells the character of a woman dealing with trauma who's put in a place where that trauma is recalled over and over: dysregulated and panicking, her responses are very human. One of the main critiques from fans of the books is that Merrily isn't tough enough, but Martin seems to me to have read the script and thought, this woman has had a terrible shock and keeps having them, and made a decision to play Merrily as someone who clearly isn't dealing with it very well. And this was the best part of Midwinter of the Spirit, and without which it wouldn't have worked: a protagonist who, when faced with horror, reacts how an ordinary person would. And that's just as well. Midwinter of the Spirit is pretty conservative in its assumptions: it explicitly frames Christianity as the Old Ways and its ill-defined occult opponent as an interloper. The baddies keep saying things like “Christianity has had its day,” and at no point are their motives for wanting to desecrate a cathedral clearly defined, other than the cathedral being an enemy. He's not in fact behind her. If you don't buy that the ancient Christian heritage of England (and it is ancient, mind, 1600 years ancient) is a thing worth protecting, then half of the stakes of the show won't matter. So thank God for Anna Maxwell Martin, who carries most of the load in getting you to care for someone whose family might be collapsing and who has taken on more than she can deal with, and her performance transcends mostly one-dimensional and borderline offensive villains and the “I would have gotten away with it too if it weren't for you meddling deliverance ministers” ending. It looks like Midwinter of the Spirit isn't going to go to a second series. Anna Maxwell Martin's version of Merrily deserves to be seen more. It would be a shame to leave it there.